Sundays — Sat evening: 4:30 p.m.; Sun: 11 a.m.
Daily — Wed, Fri: 9 a.m.
Saturdays — 4 p.m. or by appointment. Mass was celebrated in Shepherdsville during the early 1900s in a private home belonging to Mrs. John Buckman, at a skating rink, and in a judge’s chambers at the county courthouse before the construction of the first St. Aloysius Church in 1912. 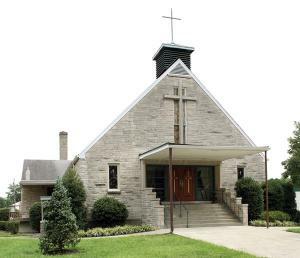 Established to serve Bullitt County Catholics in an anti-Catholic area that allegedly was the state seat of the Ku Klux Klan, St. Aloysius allowed the devout to attend Mass regularly instead of once a month. The first pastor, Father Eugene Bertello, a stocky man of vitality and enthusiasm, spoke broken English when he delivered simple, strong, wholesome sermons. He became widely known, riding his horse Keno through sleet, snow, and rain on pastoral visits. He was regarded as an unsung martyr of the church when he died in a train accident in 1917 after returning from a call to anoint the sick. The parish became the center of the Bullitt County missions after fire destroyed St. Eugene at Bardstown Junction. With increased attendance, Mass was celebrated more frequently. Religious education classes began, taught by the same parishioner who formed the ladies altar society. Soon, the Ursuline Sisters of Louisville took charge of the classes and established a summer school. Annual picnics raised funds to expand the church. After a larger church was dedicated in 1950, construction of a convent began in 1953, and a school opened in the previous church in 1954. Staffed by the Ursuline Sisters, the school expanded to include a high school, which opened in 1957 and graduated its first class of eight in 1960, but closed in 1966. A preschool was added in 2005. The elementary school closed in 2012. Also in 2005, a renovation of the church interior uncovered beautiful features of the original 1950 structure. With over 422 parishioners, St. Aloysius Parish continues to serve the community through its outreach efforts and participation in civic activities.